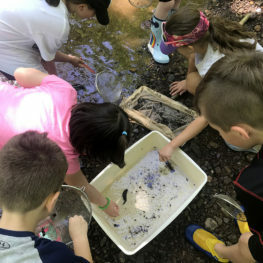 The WaterWays program fosters students’ appreciation for the natural world, from the tiniest “bug” in the bottom of their neighborhood stream to the larger ecosystem supported by the watershed in which they live. 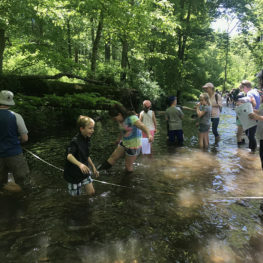 Connecting kids to the natural world, the program provides them with the real-life experience of discovering “hidden” aquatic life while conducting field observations and experiments. From these, students can make scientific observations directly related to their communities. The classroom and field experiences promote a sense of stewardship for the environment and an understanding of the ways that human behavior can harm or help natural systems. WaterWays consists of two days of learning. The first day takes place in your classroom, where our educators provide a series of lessons focusing on watersheds, groundwater and benthic macroinvertebrates. Each mini-lesson lasts 30 minutes, for a total of 90 minutes per class. These lessons provide students with an essential understanding of watershed conservation, preparing them for becoming citizen scientists during the second day of learning, the River Trip! See below for more detailed information about each of these program segments. Three, half-hour, in-class sessions take place at your school. Through a hands-on activity, students learn what watersheds are, how they function and why they are important. Using a groundwater model, students learn about the importance of groundwater, how it moves through the earth, how it can become polluted and what we can do to protect it. 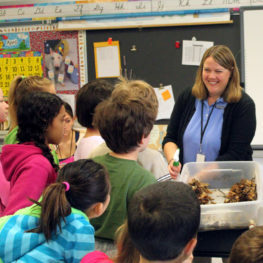 A hands-on presentation teaches students what macroinvertebrates are and how they can be used to assess water quality. Students learn to identify macroinvertebrates by using a dichotomous key and preserved specimens. Students learn to conduct tests for pH, dissolved oxygen, alkalinity, nitrate, and turbidity to determine water quality. Our team will help you scout out an appropriate stream, river or pond near your school to serve as your class’s WaterWays field site. Busing to the site may be required, but often we can find one within walking distance. Having a field site in your town allows students to develop a stronger sense of place and make amazing, hands-on discoveries in a familiar setting. This fosters a sense of stewardship in students. Students make observations and take notes on the habitat and land uses at the stream site and surrounding area. Air and water temperature are measured and recorded, as are stream width, depth, and velocity. As time allows, a nature hike may also be incorporated! Students learn how to collect benthic macroinvertebrates using a large kick net. They then identify the collected macroinvertebrates using a dichotomous key and use these biological indicators to calculate the water quality at the stream site. Students measure pH, dissolved oxygen, alkalinity, nitrate, and turbidity of the stream, and discuss the results. $205 per 30 students, includes one 1 1/2 hour in-class lesson and one 2 hour field lesson. Scholarships are available. To learn more about these programs—including exact pricing based on the number and size of classes at your school, and scholarship information, please contact Lauren Theis.